After the death of their parents, sisters Nancy and Pamela (Plum) were left in the care of an uncle, who, knowing very little about children, immediately placed them in a boarding house with Mrs. Monday, who promises to look after them. In truth, Mrs. Monday is a horrible caretaker, forcing the children to wear rags and issuing over-the-top punishments for even the most minor of infractions. When Nancy and Plum discover that she has been concealing correspondence from their uncle and stealing gifts from him to give her to own niece, the two girls decide the only thing to do is escape. This delightful novel by the author of the beloved Mrs. Piggle Wiggle series is based on stories the author used to tell her sister as a child. Though there is no magic in the story, there is a sort of fanciful feeling to it. MacDonald draws very clear distinctions between good and evil, and though the girls are often in danger, their imaginations and sense of hope keep the story from becoming bogged down in disappointment and distress. This is very much a story about wish fulfillment and happy endings, and the question is never whether the girls will escape, but how they will do it, and how they will get away with doing it. What is most interesting to me about this book is the way MacDonald uses adult characters. Many books try to leave the adults out of things and let the kids find their way on their own, in the hopes of empowering children. This book, though, does have strong child characters, but the adults who help them are also brave, strong, and determined, even though Mrs. Monday attempts to bully them as much as she does the children. It’s a strange connection to make, but I kept thinking about Tales of the Madman Underground by John Barnes, in which adults also play a major role in pulling a kid out of unsafe circumstances. Not many children’s books are willing to convey adults as caring and capable, so I found that to be very refreshing. 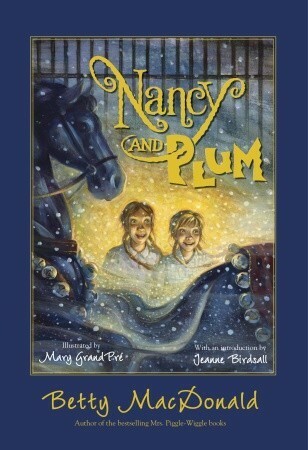 Because it begins on Christmas Eve with the girls stuck in the boarding house all alone without any presents or special food, Nancy and Plum would make a nice family read-aloud for the holiday season. It would make a nice read-alike for The Wolves of Willoughby Chase, which has similar subject matter, as well as the Swallows and Amazons series, as Nancy and Plum have much in common with the plucky and imaginative Blacketts.